I bought this book myself and was not gifted in any way! As always, my reviews are fair and unbiased. 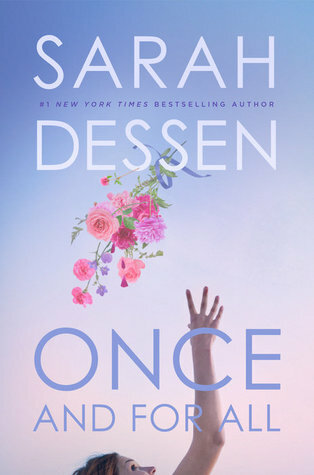 Sarah Dessen’s many, many fans will adore her latest, a richly satisfying, enormously entertaining story that has everything—humour, romance, and an ending both happy and imperfect, just like life itself. First Thoughts Sarah Dessen is a staple author for those books that make you feel all the feels. I've read a few of her books before I started blogging a few years ago, and since then, collected her releases. But Once And For All just appealed more to me than anything else when I saw it in Waterstones. It just had one of those gorgeous covers and intricate, delicious sounding blurbs that I couldn't help but fall in love with. So ultimately, I had to feature it. I finished it a few weeks ago but because of some busy IRL stuff, my blogging schedule has been all over the place. So I'm back with a bang! Let me just start by saying that this is THE novel you want on a summer vacation, cooped up on a beach somewhere or at a Lake House, absorbed in another beautiful Sarah Dessen world (or maybe to take along to a destination wedding?). I finished it in three sittings, mainly because I was busy, but I would have devoured it in one sitting if I had the time, trust me. Despite the happy cover, our main character Louna doesn't have a bright and beautiful life. Her story is hard-hitting and emotional, working at a wedding planning business and keeping everyone's special day the best day of their lives. She wants everything to go smoothly, but it doesn't always, and the stress that she was under definitely echoes though the pages to me as a reader. Bonus; I loved Louna's relationship with her mother and business partner. They had this chemistry all together as a dynamic and it was just so realistic, you know? Like I could honestly believe every word. But, enter Ambrose. He's Louna's love interest and the kind of boy that's your typical bookish boyfriend material. He's charming, suave and kindhearted through and through. After Louna's bad relationship in the past, she's forced to feel like she needs to distance herself from Ambrose - so they become friends instead. In fact, they begin caring for each other in ways Louna feels bittersweet about. She can't help but remind herself he's got female attention all the time and enjoys it, but this changes the more that they spend time together. He becomes more attentive and drops the annoying act, and they click and spark like a wildfire together. Something inside Louna tells her that she can open her heart back up to love, in many forms and ways, if she believes that she deserves a little happiness, too. I love, love, loved Once And For All. Although at times I felt it was slow, or a tad predictable (it's not hard to be in YA romances, though) I can't deny that this was such a pleasantly sweet book that I fell head over heels for. Overall, you will definitely benefit from reading this! Sarah Dessen has truly outdone herself with characters, words and romance to make your heart soar with love. Perfect For YA romance and contemporary fans! What do you think of Once And For All?